This is a time travel story. It's about something that happens in 2014 that actually happened in 1955... and it's really weirding me out. “Many people (and who can really blame them) would dearly love to have something as exciting as flying saucers really be true. As a matter of fact, so would I. It would be a world-shaking event if we could prove that space craft from elsewhere were actually visiting our earth! “Facts, however, speak otherwise. There is nothing, and I repeat, nothing, that can be regarded as scientific that flying saucers are anything but reports of misidentified natural phenomena or objects. "There are at present a number of commercially inclined individuals, addicted to sensationalism... who presume to speak and write with flamboyant authority and with naïve disregard for scientific accuracy. “Such people do a great disservice to everyone but themselves. They capitalize on the wishful thinking of large numbers of people who are legitimately interested in the possibility of space travel, and are intrigued with the idea that other civilizations, living on some far off planet, may be paying periodic visits to our own planet, the earth. “A clever speaker can, by mixing judicious amounts of space travel science fiction with extravagant and ill-reported accounts of strange events, adding a rumor here and a rumor there (perhaps about the little men who are pickled in bottles and kept in a secret vault at Wright Field!) 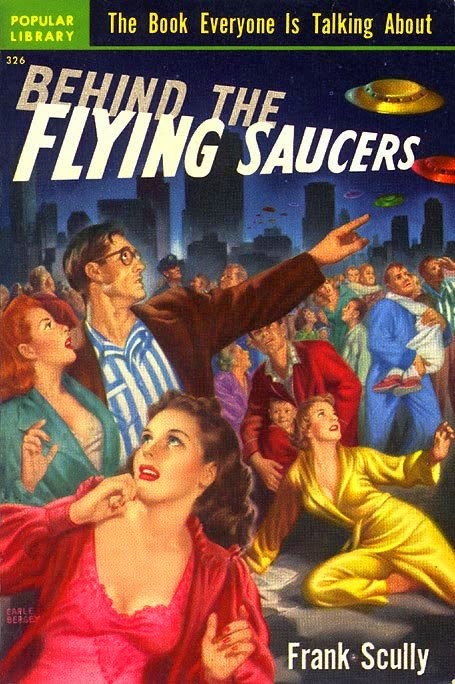 make a thrilling but highly fictional case for flying saucers. Well-written, no? And yet you sense perhaps the slightest anachronistic tone to the comments, don't you? Well, here's when the time travel twist comes into the story. This wasn't a letter that I just received from a reader; these comments were written in 1955 by my man, Dr. J. Allen Hynek. This was part of a popular newspaper column Hynek wrote for the Columbus, Ohio, Dispatch in the 1950s called "Scanning the Skies." Generally the Doctor wrote about comets and eclipses and planets and the like, so this particular column dealing so forthrightly with UFOs is very unusual... The archivists at Northwestern University claim that this was the first time Hynek mentioned UFOs in public discourse, and that may very well be true. Just exactly who these "commercially inclined individuals" were that the good Doctor was excoriating way back in 1955 (and why, just at the point in his career when he was seriously interested in UFOs as a scientific problem, he decided to publicly lash out against the phenomenon) is a mystery that I will attempt to solve in my book, but for the purposes of this post I thought it was quite uncanny that his words could easily have been written today in regards to the people and things I listed at the top of this post. How strange, and how sad, that the UFO field is in 2014 still rife with "commercially inclined" people "addicted to sensationalism" who try to make a "thrilling but highly fictional case for flying saucers." And in case you didn't catch the one truly mind-blowing tidbit in Hynek's comments, it was when he mentioned "the little men who are pickled in bottles and kept in a secret vault at Wright Field!" Subtlety, thy name is Frank Scully. Of course this story had been kicking around for at least 5 years at this point, since Frank Scully had described alien corpses recovered from crashed flying saucers in his 1950 book "Behind the Flying Saucers," but I find it fascinating that the alien corpse story had, by 1955, already taken such a hold on the public's imagination -- even though it had been debunked three years earlier! -- that Hynek still felt it necessary to shoot it down. And now, some 60 years later, we still can't weed out the alien corpse come-ons. Think about that the next time you get an invitation to a UFO conference or tune in a moronic cable TV show about UFO hunters or mysterious hangars or unsealed files. I know I will. Curious... do you think Hynek was so full of bluster because he was pretty much paid to be a debunker, or do you think this was his honest opinion at the time and he had a change of heart later on? And speaking of UFO shows, I saw the newest offering on the Science channel the other night. It's called Close Encounters and I must admit it's not bad. They basically do recreations of classic UFO cases and have guys from MUFON and CUFOS as the obligatory expert talking heads. From what I saw, it's a fairly sober and straightforward show. No wild hypothesizing or loony theories. Sure, they're not breaking any new ground with the cases they're covering, but it's nice to see a show that's not full of crap. Keep in mind Sturgeon's Law. It applies to ufology and many other fields of esoteric or fortean endeavor. Matter of fact, most everything or anything. Also remember Hynek's realization that UFOs might be something other than the usual prosaic phenomena, misidentification, hoax, etc., didn't come until the Michigan sightings in 1965/66. After that he was a convert. Before that, he was kind of a useful and convenient USAF tool. Sometimes it takes a while for "objective scientists" to see the light through the telescope of experience. To A Wise Old Reptilian: Actually, Hynek's thinking had already shifted quite a bit by 1955. By that time he had investigated his first truly compelling case in Bismarck, ND, he had conducted his nationwide survey of astronomers and found that 10% of them had seen a UFO, he had made a plea to a gathering of fellow scientists for a scientific approach to UFO investigation, he had made his famous statement that "ridicule is not part of the scientific method," and he had witnessed the fiasco of the Robertson Panel. That's why this dismissive column from Oct. '55 is to me so completely out of character. This column is something you would expect from 1947 Hynek, not 1955 Hynek. The "turning point" for Hynek might have been what happened after the "Washington Nationals" (consecutive weekends UFO flap near and around the D.C. area), kind of the culmination of the '52 wave, and the disappointing Gen. Samford denouement (a.k.a press conference) with the rather specious "temperature inversions" non-explanation, and what followed, in the "turf war" between the USAF and CIA (initially spurred due to Truman's concerns) over which would respectively either keep or take over the investigation into the UFO phenomenon, and the subsequent failure of the CIA's OSI to gain traction over the USAF due to ATIC/BMI obstruction, with the added "benign neglect" of former USAF General W.B. Smith, then director of the CIA (the military version of the "old boy" network in play? 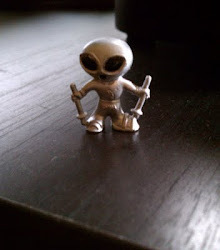 ), who was on his way out with the change of administrations, not supporting OSI's Marshall Chadwell, et al, in their efforts to challenge the USAF's PBB project, and OSI's attempt to elevate the investigation to a higher level, and conduct more thorough or actual scientific investigation and analysis of the UFO phenomenon. The fix was already in by late 1952. The CIA Robertson Panel's meager, incompetent (?) efforts over a few days, and their findings and recommendations, contradictory as they were, could have been the final straw for Hynek, and was certainly a fiasco for serious UFO investigation by the government from that point forward. At least "publicly." Maybe those two or three things together, within six months, i.e., the D.C. sightings, Samford's press conference to dismiss them, and then the disaster of the Robertson Panel all combined in Hynek's mind to make him feel or think not only was the fix in, but that, you know, just maybe there really was something "otherworldly" or at least truly unknown about or to the best cases and circumstantial evidence for the UFO phenomenon being something other than what his sponsors and bosses would have preferred him to say, believe, and think. And that Hynek was smart enough to keep his growing misgivings largely to himself, staying very discreet, and perhaps publicly toeing the "establishment line" when and if it was required to stay on good terms with the "powers that be" in the USAF/ATIC/PBB/BMI matrix he worked for, just to maintain access, as his consideration of the phenomenon evolved over time. As to the October 1955 column, I'm guessing there was, as the wiki entry suggests, a public Hynek, and a private Hynek, in terms of how he expressed himself about the UFO phenomenon. He did have to maintain his position in good standing with the USAF/BMI as PBB's consultant, so that was probably a factor. Keep the bosses happy, to stay in the fold. But, you're right, it is odd. Imagine the psychological conflicts and emotional turmoil Hynek must have had at times, like the "swamp gas" fiasco of 1966 the press turned into a sensation, regardless of what Hynek actually tried to say about the overall Michigan sightings. Kind of tragic, in a way. Ufology's Hamlet? Ref. the "to be or not to be" soliloquy. Slings and arrows and all that. You should try to interview Vallee for further insight, if you can actually get him to talk about this seeming kind or sort of "cognitive dissonance." I wonder what was happening in PBB, or Hynek's life, just prior to the Oct. '55 column coming out that might have helped prompt it? Interesting analysis! 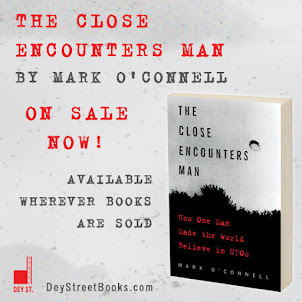 Of course there is more info I'm not sharing here; it will all be revealed in the book.